The expertise of chain drive specialists at Tsubaki UK is being called upon to help manage winter water levels, particularly in low lying parts of the country. The aim is to control river flows and reduce the instances of flooding which is becoming increasingly important as climate change is leading to warmer, wetter weather. 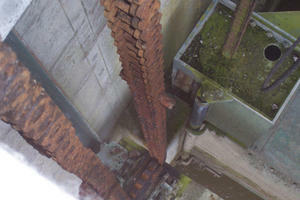 Tsubaki supplies high performance chain for operating lifting gates in water level control centres. These centres are used to regulate the volume of water in rivers so that they don't burst their banks and flood towns, villages and valuable farmland in areas like the Somerset Levels and the Norfolk Broads, which would otherwise naturally flood almost every year. Greg Sharp of Tsubaki explains: "These lifting gates basically have a summer setting to hold back water for crop irrigation and a winter setting to open up and release potential flood waters, so typically are usually operated only a few times a year. The chain has to be strong enough to cope with the high loads applied when lifting the gates. However, the real issue is that they are usually in remote locations, so receive little or no maintenance, yet are expected to function perfectly over a lifetime of twenty years or more. Traditionally there has been a problem in that the chains can become stiff and difficult to articulate due to wear and corrosion brought about, in part, by lack of lubrication. This can cause the gates to jam in mid-travel, or even lead to chain failure." Tsubaki's solution is to produce retro-fit chains that will connect to existing gate fittings and mounts, to make upgrading a simple process. 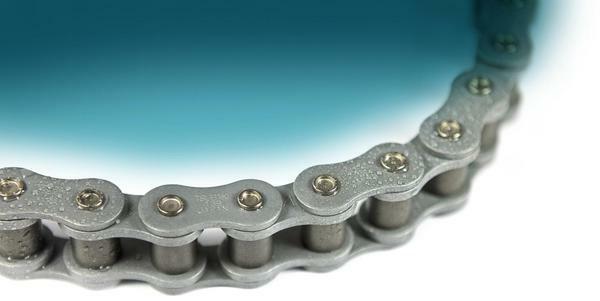 The wide range of chains include standard and bespoke roller chains and cranked link chains which are complimented by upgrade options. "Our recently upgraded Neptune coating is ideal for corrosion protection in the harsh environment. There are also standard options to coat the chain in high adhesion wax based lubrication coatings, benefitting both wear and corrosion resistance." says Greg. 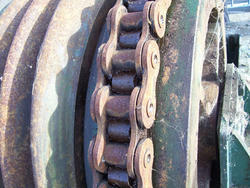 "The lubrication is fit for the life of the chain and therefore no maintenance is required." Tsubaki is able to offer a wide range of attachments, so that chain can be customised to particular applications. For the water control gate extended pin attachments are part of a fail-safe system, which is designed to catch the gate if it should fall and hold it in position until a repair crew arrives. In a similar water industry application, Tsubaki also supplies a variety chains for water processing and treatment plants. Although usually out of sight and out of mind, water treatment works are a vital part of modern society and must work reliably at all times. Once built, they will typically run constantly for 100 years or more and are a cornerstone in the public health strategy for the region they serve. Chains are used as part of the processing and protection of the water processing plant. In such an application a standard chain would have a very short life due to the combined effects of corrosion and chain elongation. Tsubaki supplies many treatment works with a long life chain reducing wear and corrosion. This leads to several benefits for the site: the overall amount of downtime required for maintenance is reduced and thus the processing plant is better utilised, which in turn generates an increase in efficiency. Also chain replacement costs drop, releasing funds for other uses.